When sung by the North Korean ensemble Chongbong Band, these American lyrics could seem out of place. And perhaps even more so when Stephan Haggard embeds a video of the performance on his esteemed blog, North Korea: Witness to Transformation. It’s a prime example of how Haggard, with colleague Marcus Noland, use atypical forms of information to piece together a coherent picture of North Korea. 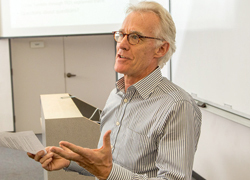 “The explosion of data is changing the way we think about public policy,” Haggard explained. “Our claim to fame is partly figuring out interesting ways to get data on a country that is very closed, opaque and difficult to deal with,” Haggard said. It’s an approach Haggard also has channeled at GPS to equip students with the similar skills to be competitive across a slew of job markets. And it’s one he’s stuck to throughout much of his research on North Korea, most of which has been with Noland, executive vice president and director of studies at the Peterson Institute for International Economics. Their collaborations started with an invitation from Noland to Haggard to help on a project on the famine and whether food was being denied to North Koreans as part of a political agenda. Using data collected by aid donors they reconstructed the food economy, showing how the famine could have been avoided with relatively small adjustments by the regime. They also showed how food was diverted from donors to the market. This analysis culminated in their first book, “Famine in North Korea: Marts, Aid, and Reform,” published in 2007. Since then, their names have gone somewhat hand-in-hand in their research on the country, resulting in two more books and hitting the ground to influence policymakers such as by testifying in front of Congress and the Commission of Inquiry of Human Rights in North Korea. 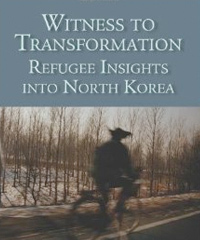 The duo expanded on their first collaboration with a second book, “Witness to Transformation: Refugee Insights into North Korea.” Through refugee surveys, the book explored everyday life in North Korea—how households coped with scarcity and even what they thought about the regime. It inspired the creation of their blog with the same name also in 2011. For instance, Haggard has penned posts on human rights law, refugees, nuclear issues, economic reform and social issues, among other topics. And though the professor has made a name for himself as a researcher on North Korea—due in part to the blog’s success and as director of GPS’s Korea-Pacific Program—he need not be pigeonholed into just that realm of research. “I like to keep an eye on larger issues,” he said, noting he also has had a lasting interest in comparative politics. For some perspective, he pointed toward his book, “Development, Democracy and Welfare States: Latin America, East Asia and Eastern Europe,” published in 2008 with Robert Kaufman, which focuses on social policy in developing countries. Recently, he has just completed another book with Kaufman, set for publication next year, that considers the third wave of democratization that began in the 1970s and the role that inequality plays as a barrier to democratization. His third title with Noland also is scheduled for publication in 2016. The book explores the political economy of Northeast Asia, based on surveys from Chinese and South Korean firms doing business in North Korea to get insight into sanctions and engagement.